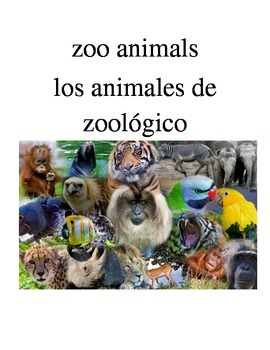 A PDF with animals associated with a zoo in English and Spanish. 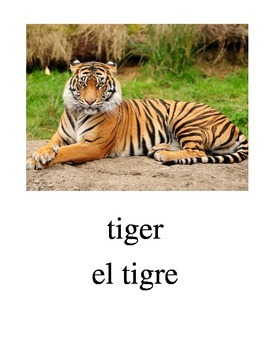 A picture at the top of the page shows the animal with the words in English and Spanish underneath. 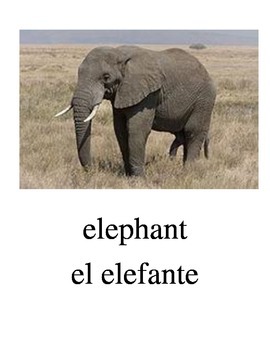 There is one page for each animal (monkey, elephant, zebra, giraffe, lion, tiger, bear, kangaroo, crocodile, alligator, cheetah, hippopotamus, jaguar, kola, leopard, prairie dog, rhinoceros, chimpanzee, buffalo, panda, gorilla, wolf, and a title page). They can be used as a book or posted around a room. 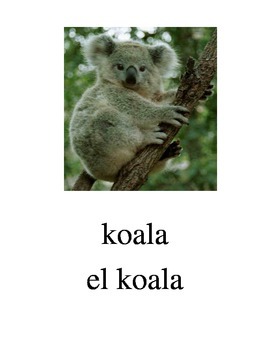 If you like these zoo animals, you might also like my other animal collections. Check out my pets, birds, aquatic animals, bugs, farm animals, and animals.